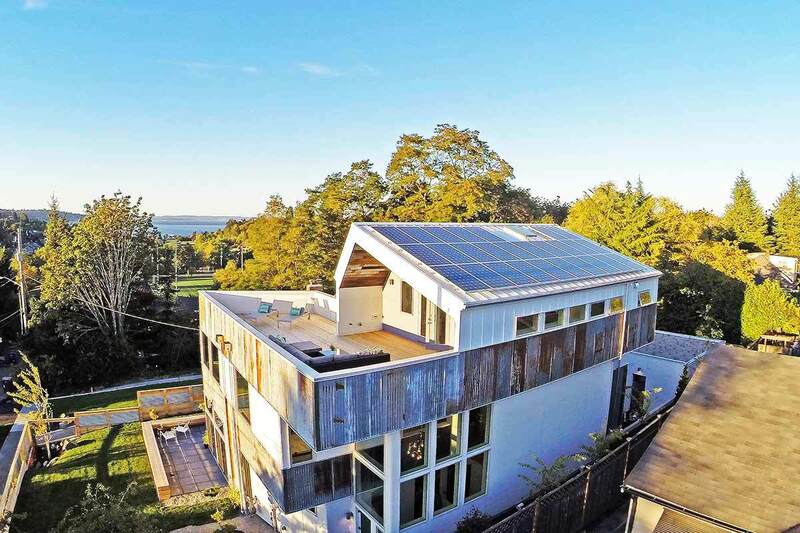 It makes sense that we'd start the list off with an environmentally friendly home because, hey, it's the pacific northwest, and that's how they do things (just wait till you see the luxury homes in Portland). 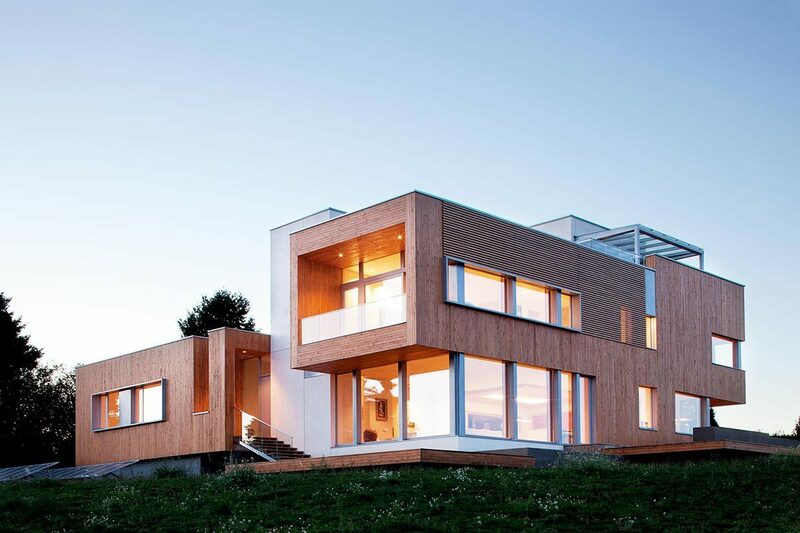 Dwell Development set out with the goal of building this home to have net-zero energy use. Solar panels on the roof soak up as much sun as they can and convert it into electricity to offset the residents usage while the best energy saving devices manage the energy use as efficiently as possible. The home is made of locally sourced reclaimed materials but it doesn't miss a beat in terms of keeping up with modern design. 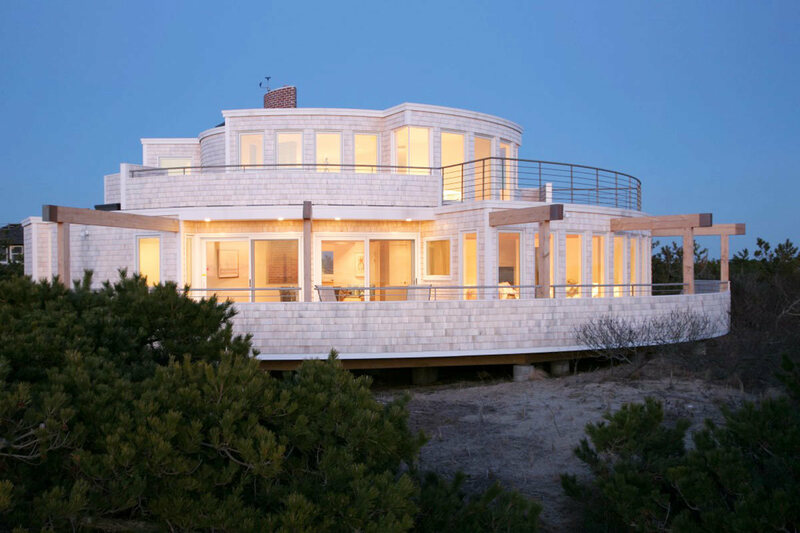 We love it when there is a seamless transition between the inside and outside and Julian Weber Architects did just that when creating the roof deck. First Lamp Architecture made the most of a difficult task, designing and building a home situated on a major slope. Instead of fighting it, they embraced it. The major part of the home juts out over the slope and into the trees making people situated in the living room feel a bit like they are in a tree house. 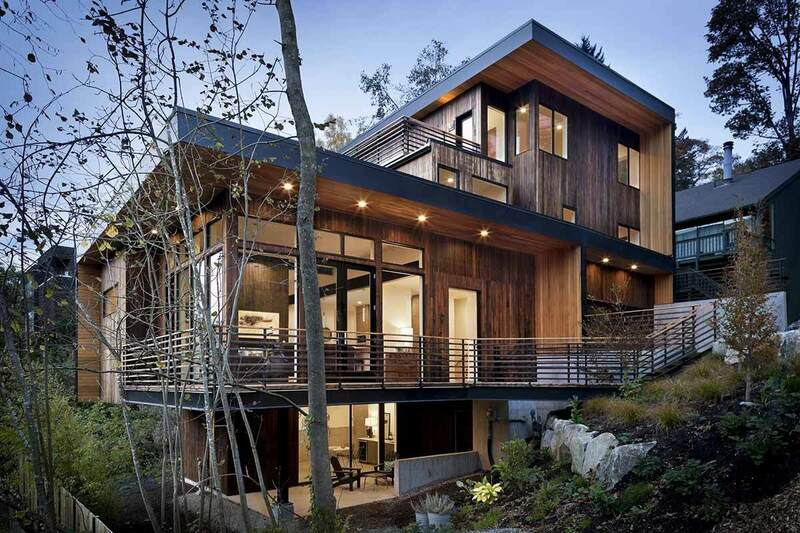 We love the choice of materials and modern form of this beautiful home. There's a very usable outdoor space underneath the walkway/balcony that perfectly suits the Seattle climate and there's nothing about this design that doesn't make sense! 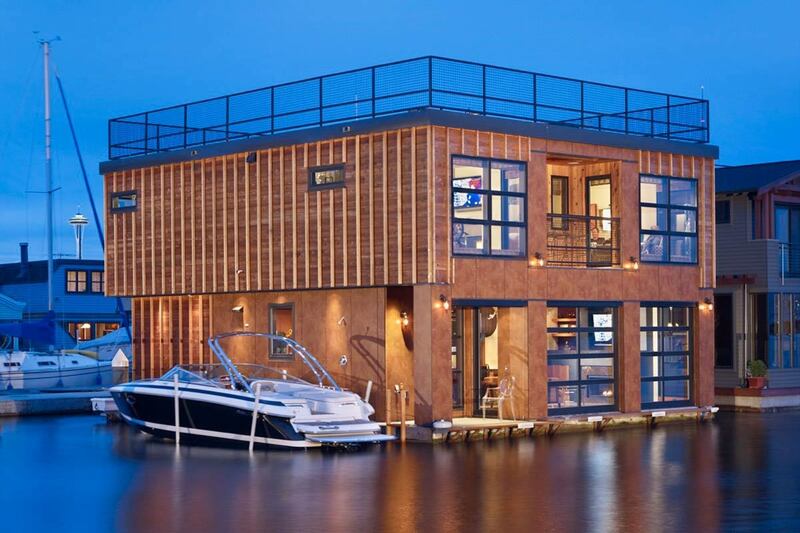 It wouldn't be a list of Seattle luxury homes without one of its famous floating homes. We all dreamed about living in one after seeing Tom Hanks in Sleepless in Seattle. Designs Northwest Architects took a straightforward approach to the overall layout, since you aren't left with a lot room for experimentation when building on a pier. That didn't stop them from making a beautiful home with some amazing features! 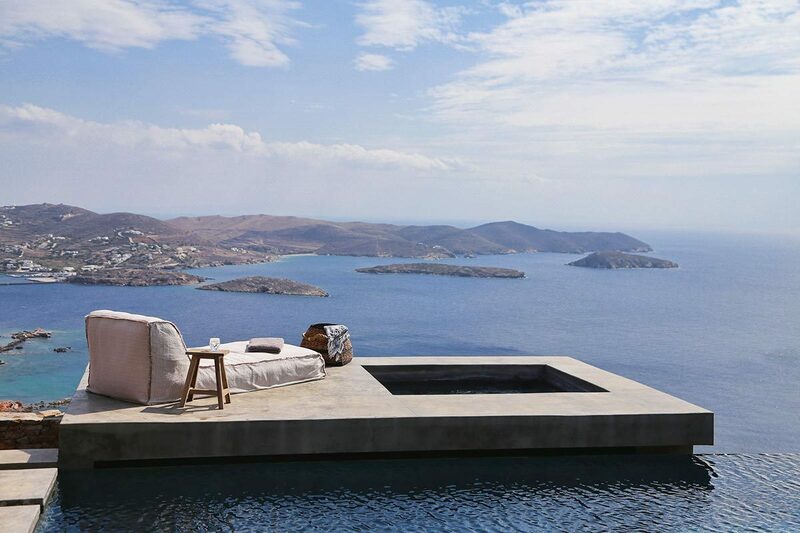 Large garage door style openings let in the sea air while letting people enjoy the view unhindered. Garage door style glass openings work for any house, so consult a garage door contractor if you're interested! Even though you're in the middle of Lake Union you still feel a bit like you're on a private island. Cozy up by the fire and enjoy the gentle sea breeze! 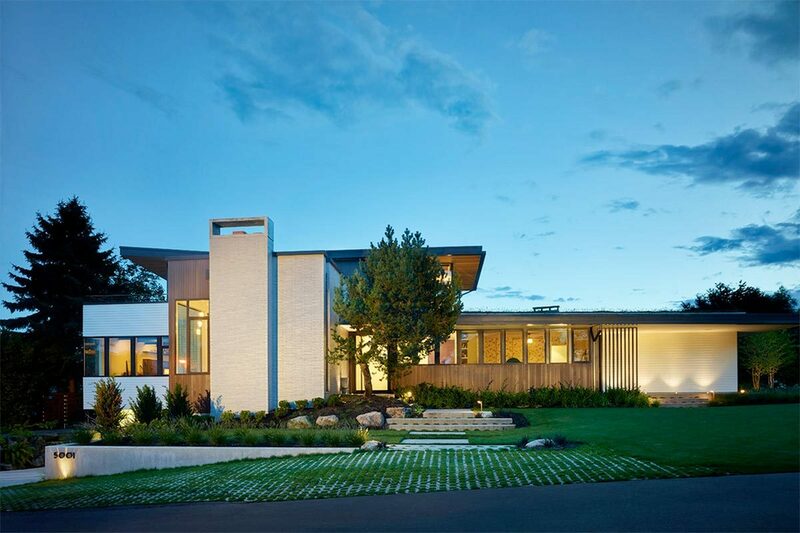 This 2,500 sf home by Coates Design Architects uses 70% less energy than an average home of its size. That's no accident. 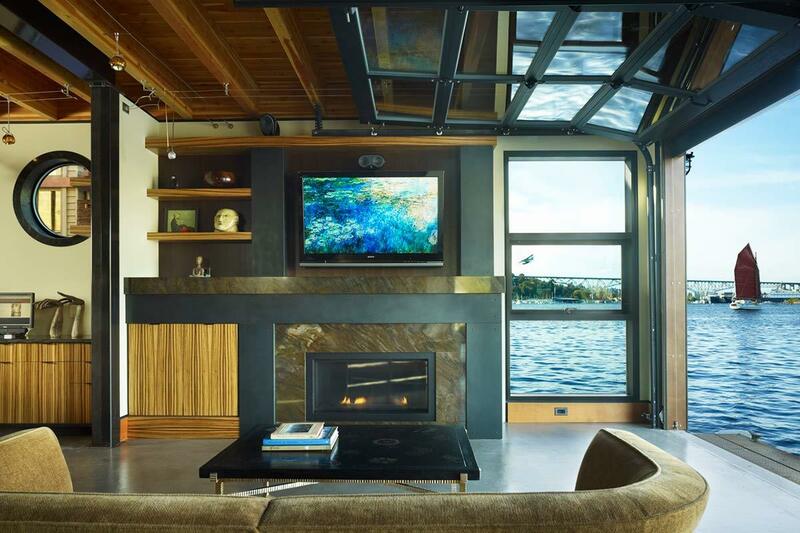 Coates is dedicated to designing energy efficient homes in Seattle. This home is the perfect example as it is designed to capture sunlight and shade as they are needed to heat and cool the home. A combination of geo-thermal and solar thermal heating dramatically brings down energy use. We love certain design aspects like the bar nook off the living room which is framed in matte metal siding, a great contrast to the warm wood. There are quite a few materials working in conjunction here but all of them work together to create a fantastic example of pacific northwest architecture. This lake house by McClellan Architecture is a classic. 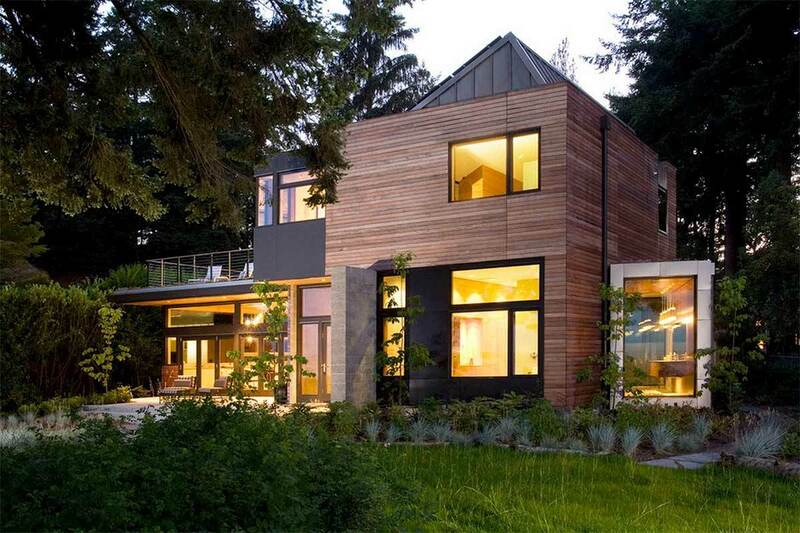 Created by a firm who knows how to build homes for the Seattle climate. More of a rustic retreat than an urban home, all you want to do is curl up by the outdoor fire place. Let's be honest, when you live in a place that is overcast 6 out of 7 days from October-April then you at least want to come home to a place that feels cozy and inviting. 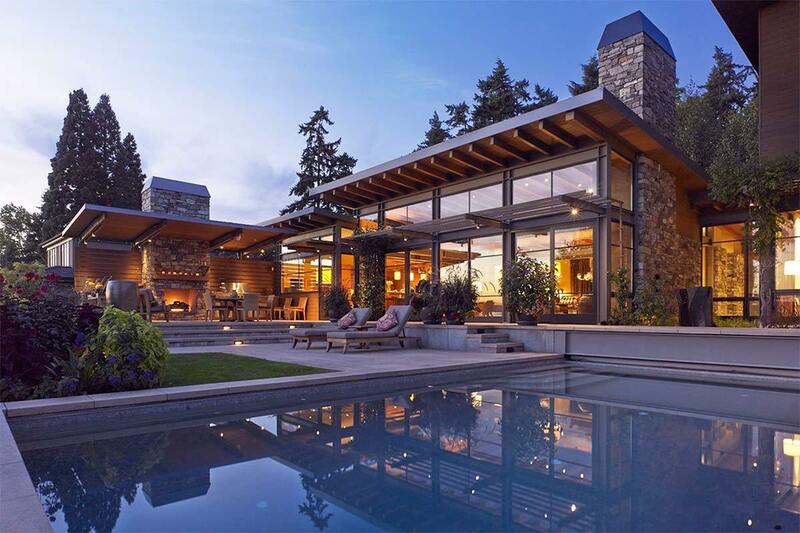 Modern features like the concrete patio and large windows make sure this home doesn't shy away in and among the traditional Washington homes that surround it. We love this mid-century throwback.This is one of our favorites of the list because it does what we love best, bring an old home back to life! Lane Williams Architects started off with a structurally sound 1950s home and endeavoured to build a second story and make some modern updates. 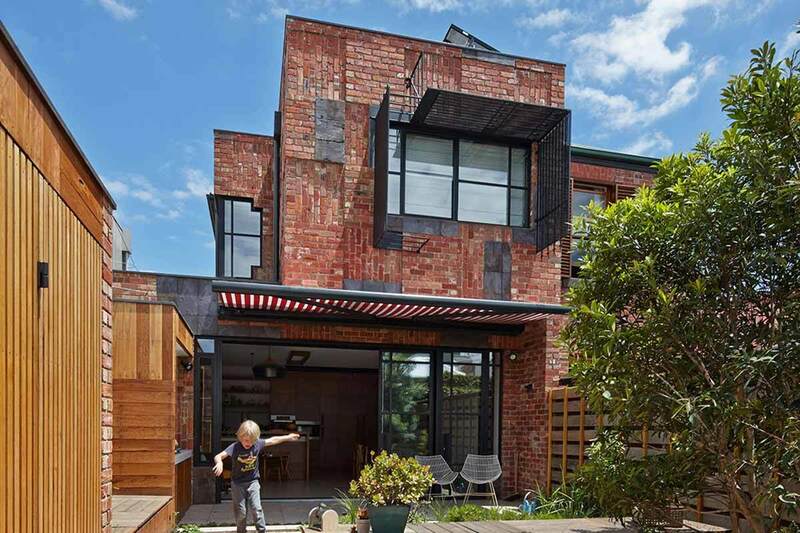 The very flat roofline juxtaposed by the dramatic overhanging roof of the second floor creates a gorgeous silhouette. Contrasting materials like metal siding, warm wood and brick were chosen very tastefully to look modern but still maintain the mid-century aesthetic. The front yard landscaping is also beautiful, keeping it lush and tall where attention should be drawn and flat everywhere else. A brilliant 1950s design that would fit in well with some the beautiful homes you'd find in Los Angeles.